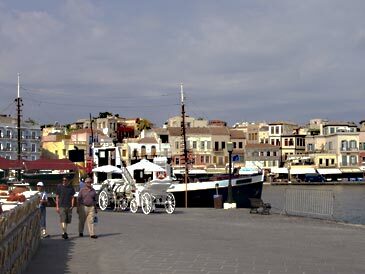 The old capital, Chania, huddles round the Venetian harbour, with alleyways criss-crossing each other behind it. The quayside is awash with tavernas and there is some quite sophisticated night-life in the streets behind. 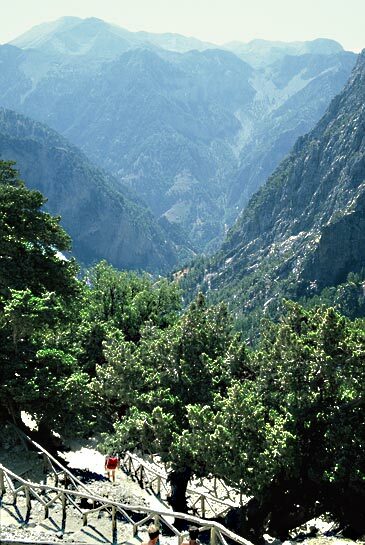 It is a good base for excursions: you can do the Samaria Gorge from here in one day, by local bus or an agent’s coach tour. You can enjoy the excellent sandy beaches of the Akrotiri peninsula or absorb British military history in Souda Bay just east of Chania. The verdant foothills of the White Mountains rise behind the town and offer wonderful views from pretty villages amongst orchards. 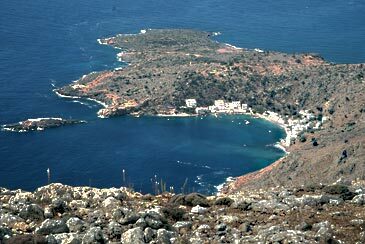 Just three village names which trip off the tongue in this glorious hill country 25km SW of Chania. Barely 15 minutes’ drive from the north coast near Kolymbari, an hour or so from Paleochora on the south and rather less from Falassarna on the west, you could hardly be better placed – staying in utterly unspoilt surroundings yet with “civilisation” and beaches on the doorstep. But there’s a good reason for staying put: to get fit. The various treatments which three girls provide in the spa (not to mention the organic cuisine) were highly praised by clients when we visited it. These include anti-ageing, energy balancing and slimming treatments involving a huge choice of aromatherapy, mud, essential oils and other forms of massage, acupuncture, Turkish baths, face and body masks. Individual programmes for 1-5 days are recommended after an initial interview. An hour’s drive west of Chania is Falasarna, a vast sandy beach beside a coastal plain dotted with plastic greenhouses nurturing tomatoes. 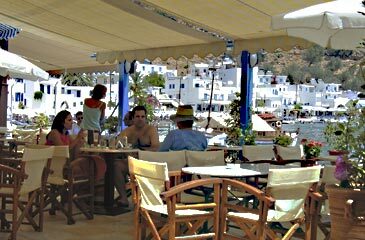 You can rent chairs and umbrellas on the sands and there are at least two tavernas. Occasionally the Meltemi blowing from the N can occasionally make the bay rough for bathing. At the far end of the beach is an untended archaeological site - just wander in. 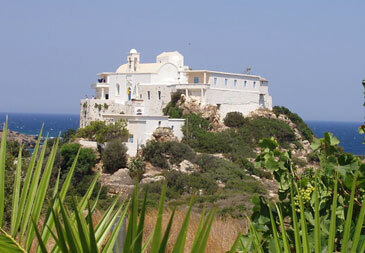 There are boat trips from Kastelli (and Falasarna itself in HS) to the Gramvousa peninsula’s lagoon. 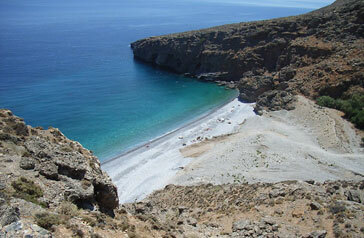 To the south the scenic corniche leads you past the Chryssokalitissa monastery to the famous sands at Elafonisi. Until recently, there was nowhere to stay near this amazingly calm, peaceful lagoon between the shore and the islet of Elafonisi. 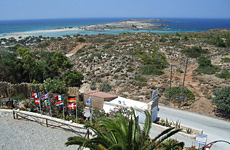 It is a popular day trip for tourists – even Martians – staying in the western part of Crete, so do not expect the beach to yourself, though the further you walk the quieter it becomes. The sands are soft and welcoming and there are beach cafes. In late afternoon the crowds disappear. Paleochora is a busy little town, maybe a little over-busy in high season, which is why we feature Kountoura a few km west. 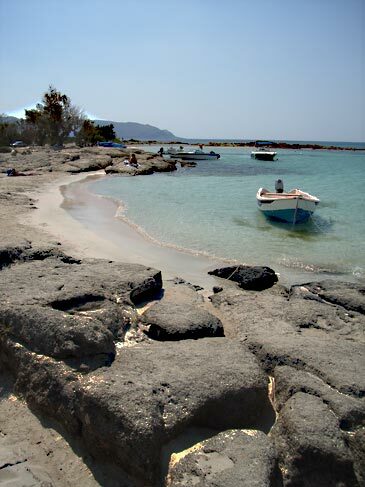 The huge sweeps of sand at Paleochora give way to more intimate beaches as you near Kountoura. This is a good place for relaxation as the sightseeing is limited to an excursion to the Samaria Gorge (OK, hardly relaxing) or a whale-watching boat trip, though the really adventurous can sail across to Gavdos, the most southerly point of Europe. Paleochora itself is not really hidden, but for a group with mixed tastes and ages it can be just the thing. 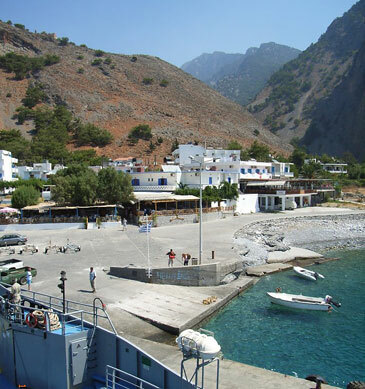 Loutro has no roads - you park at nearby Chora Sphakion and take the fairly frequent ferry. 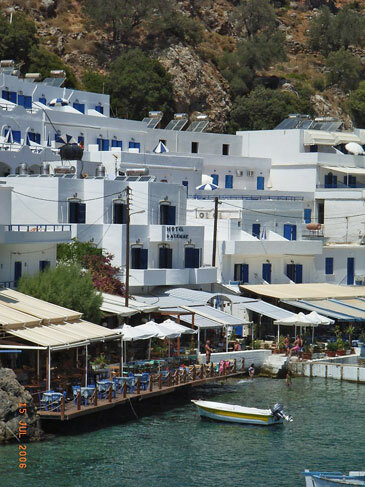 Loutro is little more than a harbour-front lined with tavernas, a smallish pebbly beach, a bay of translucent turquoise water lapping towering cliffs. 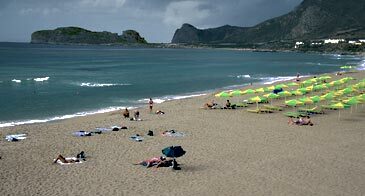 There is excellent walking, including a gorge or two, either west along the coast or up steep tracks into the hills; there’s a good beach a little to the west with a nice taverna. 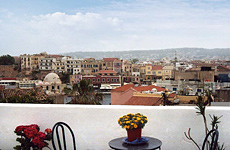 Right on the Venetian harbour-front in Chania, this manor house is now a boutique hotel. It is entered from a narrow alleyway at the back where you find its shady patio and the restaurant - for breakfast or perhaps a smart dinner. All rooms are different, with character and traditional furniture. On the road to Akrotiri, 15 minutes from the centre on foot (but bus to the door). Sea and a beach nearby. This 19th century restored mansion has a spacious bar, reception and dining rooms, as well as a new wing with excellently appointed bedrooms. There is a supplement for the original bedrooms with antique as well as modern comforts. 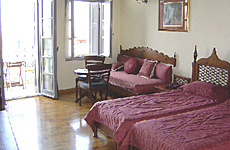 The hotel is set back from the road behind a large airy garden and the roof-terrace offers views over the town and sea. Cat.B; air-con, phone, internet access, sat.TV, hair-drier. B&B. Historic quiet corner building in a pedestrian area in the old harbour quarter. Just four simple rooms on two floors above the owners' shop. The roof-terrace with panorama of the city and harbour, is perfect for a relaxing evening and ideal for meeting other guests. 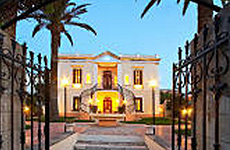 An elegant manor house on the coast road to the Akrotiri Peninsula on the edge of town. Traditional antiques everywhere and the atmosphere of a British embassy. Rooms and air-con suites with sea view or overlooking garden behind. Bus to town from the door. Cat B. Bar & patio; roof top panoramic restaurant. B&B. 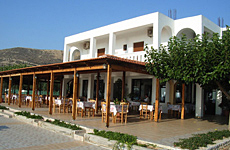 Right on the seafront at Nea Chora, Chania's beach resort 10-15 minutes on foot from the old town. A terrace facing the beach allows you to enjoy views out to sea, with offshore islets providing the backdrop for the sunset as you have a drink. The hotel is newish, sparklingly clean, friendly and architecturally unpretentious; but perfect for mixing beach days with sightseeing. Phone, balcony; most with fridge. B&B. A small complex of studios and apartments set round a huge pool in flower-choked gardens on a hilltop 5 km south of Chania; breathtaking panorama of the city, the coast and off-shore islets from the terraces. 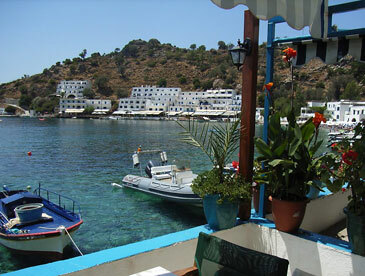 Anglo-Greek management, so everything works; for unadulterated Greek atmosphere a taverna is a few moments away on foot. Air-con, phone, safe-box; baby-sitting. S/C 2-5 pers. 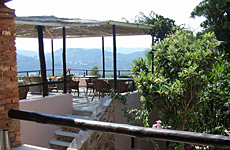 This small establishment, a renovated stone house knee deep in flowers and surrounded by fruit trees, organic vegetable plots, the world’s oldest (2500 years) olive tree and with a stunning view to the sea from its viewing terrace, is the perfect place for a pampered, healthy stay. In the grounds, but away from the house, is a large pool with terrace. With only nine rooms, the ambiance is utterly informal: this is a place where the ingredients (health treatment and cuisine) are professional, but the service informal, friendly and relaxed; a perfect mix. There are three grades of room, the difference being size rather than the antique furniture and [non-antique] fittings. Villa Elianthi, 3-bedroomed house, 100m away, with bathroom, large dining room, spacious kitchen, fabulous panorama to the sea, may be rented. The Inn’s pool may be used and the health spa facilities are available optionally. Quite newly built, they and their breakfast terrace and pool literally overhang the glorious beach at its widest point. Air-con, pool, fridge, all rooms with balcony & sea view. B&B. 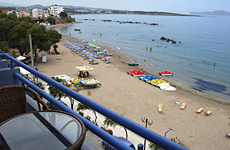 Voula provides the meals in the conservatory overlooking the beach. Anything which can be organic or home-grown here is, so you can have a healthy stay. The studios and apartments are in small 2-storey buildings dotted amongst olives and other shrubs, away from the daytime crowds and magically silent at night. Kountoura: some 6 km west of Paleochora, beside a large swimming pool, with exceptionally well finished apartments and rooms (with fridge) above: lovingly tiled sh/wcs, good furniture, double glazed doors and windows. A second building in the gardens has 10 simpler rooms. Rocky coast makes a nice view, but super sandy beach 2 mins drive away. Air-con. S/C or B&B, 2-4 pers . A newish hotel of a dozen rooms, each of which has a balcony right on the waterfront.